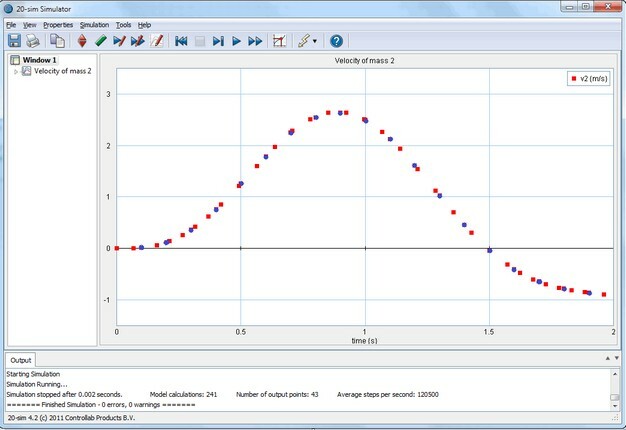 Select the Resample Curves command from the View menu to sample a simulation run with a fixed sample time. This is useful if you want to use your simulation results in other programs that need data with a fixed time step. An example is given below where a curve (red dots) is shown that is simulated with a variable step integration method. Resampling with a sample time of 0.1 s will result in a curve with only the blue dots. Use the Resample Curves command to get equidistant timing in the plot. Selection of the Resample Curves command of the View menu pops up the Resample Curves dialog. 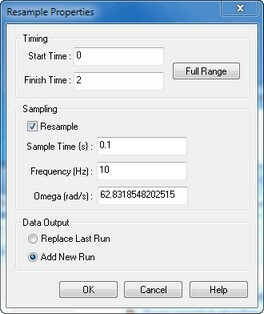 You can enter the amount of data that you want to resample and the sample time or frequency. To get simulation data with a fixed time step, using a fixed step integration method is not enough, because this data may contain additional steps generated by time or state events. Only the Resample Curves command will guarantee fixed time step data!